Under no circumstances I suggested that Bigpoint as a company has problems in my last blog post - on the contrary. Even if some games so have problems after running 6 years a company like Bigpoint has a diversified portfolio to counter those revenue holes. 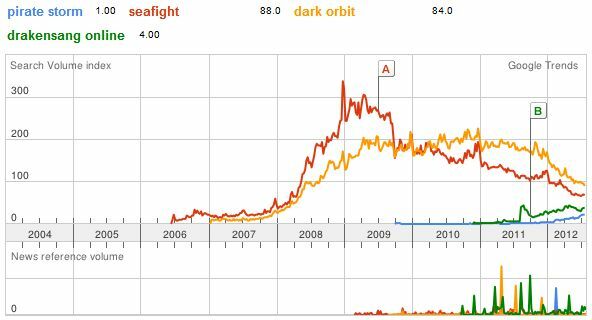 As you can see Seafight and Dark Orbit are so tiny against Famrerama that you can barely imagine how big that game is for Bigpoint. As they expand their casual portfolio I guess thats only part of the picture. They just anounced Rising Cities. Readers who follow the industry know that Bigpoint recently lost some of their talented managers. Readers with detail knowledge also might know that Travian lost their CEO with the original founders moving back in, merging their Travian Games with Travian Publishing. So what is happening? Is this the first sign of saturation? It can't be denied that the amount of free to play content has increased 10 fold over the last years. As the games industry finally accepted the concept the number of titles being released is staggering. This means competition is much higher, choice is manifold so users leave games more easily for new experiences. Since beginning of 2012 there is a huge downwards trend in Bigpoints' key titles while their new ones didn't catch up yep (Note: Farmerama and SG not mentioned). Interesting to see that Bigpoint tries to find a replacement for the troubled Seafight with Pirate Storm or Kultan - why else would they release two similar pirate games at once. It seems that the downwards trend started sooner on this genre. 2009 generally was a year where a lot of games has been hit (see first chart - Seafight). What happened 2009? What happened begining of 2012? I am into this and very curious. I get many requests for the slides of that talk, so I simply posted it on slideshare here. Have fun, and don't forget to quote me please when you use it.